1964 - The first laboratory at Garvan shared by two scientific staff assisting Drs Les Lazarus and John Hickie – Ms Gillian Henson (left) and Ms Margaret Stuart. 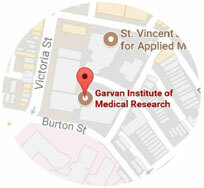 The Garvan Institute of Medical Research began its existence as a small research department of St Vincent's Hospital in Darlinghurst, Sydney. The Sisters of Charity, who founded the hospital in 1857, used funds raised from their Centenary Appeal to establish the Garvan Institute. One of the primary donors to the appeal was Mrs Helen Mills, who contributed 100,000 pounds. She requested that the Institute be named after her late father, James Patrick Garvan (1843-1896), a distinguished NSW parliamentarian and business leader. Construction of the original Garvan Institute building began in January 1962 and the Institute was officially opened on 17 February 1963 by Bernard Marmaduke Fitzalan-Howard KG, GCVO GBE, the 16th Duke of Norfolk. There were three co-Directors during the first years, Les Lazarus, John Hickie and Gerald Milton. The late 1960s and 1970s saw the expansion of scientific staff at Garvan, including the arrival of a critical mass of key senior researchers, many of whom are now recognised as ground breakers in their field. Les Lazarus became the sole Director in 1969 and continued to lead the Institute for the next 20 years. The Garvan Research Foundation was established on 1 January 1981, with the aim of supporting, assisting and promoting scientific and medical research within the Institute, and raised $110,000 in its first year (this has grown to around $20 million a year). In 1982 the National Health and Medical Research Council (NHMRC) awarded Garvan its first Program Grant for research into diabetes, while in May 1983 the Council of the University of New South Wales approved the affiliation of the Institute with the University, which continues to this day. The New South Wales Parliament passed the Garvan Institute of Medical Research Act in 1984, incorporating Garvan as an autonomous, non-profit research institute. 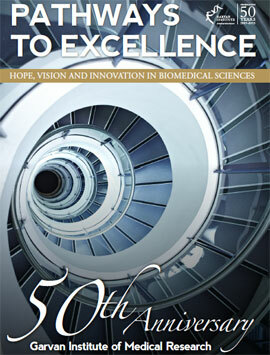 In 1986 the Institute became one of only five 'centres of research excellence' in Australia to receive NHMRC block funding. That, along with subsequent infrastructure funding from the NSW Government, allowed Garvan to expand into a leading edge research facility. Prof John Shine was appointed Executive Director in 1990 and led the Institute into the molecular biology era and the major expansion phase in the 1990s. 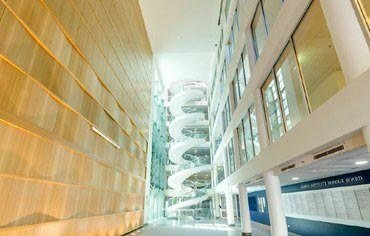 NHMRC funding and increased public financial support through the Garvan Research Foundation allowed the Institute to increase dramatically in size. The Institute was granted a large infrastructure grant by the NSW Government in 1994 and used this funding to build the world-class research facility it is currently, housed in on the site of the original Garvan building. The new building was completed in 1997 when it was opened on 7 April by Prime Minister John Howard and New South Wales Premier Bob Carr. After the molecular biology developments of the 1990s came the 'big science’ of our current century. The launch in 2000 of the first draft of the human genome led to huge sequence databases and gene arrays, removing the need for painstaking testing of individual gene activity. Gene chips allowed researchers to look at 40,000 genes at once to determine how gene expression is changed in disease. 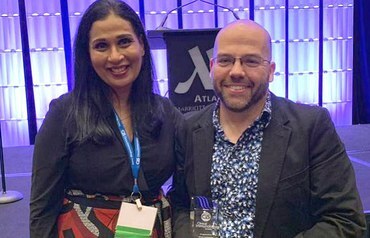 Garvan embraced this new research model quickly and, in a similar way, also later embraced proteomics and epigenetics, as well as the bioinformatics expertise required to analyse and interpret huge datasets. 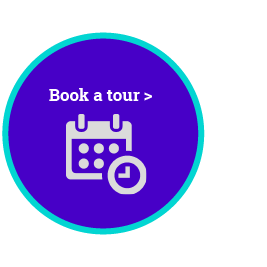 In 2012 Garvan and St Vincent's Hospital opened The Kinghorn Cancer Centre, a state-of-the-art translational cancer research centre designed to deliver the promise of personalised medicine and extend Garvan's basic cancer research to address clinical challenges more directly. Prof John Mattick was appointed Executive Director in 2012 and drove the application of Next Generation Sequencing across research areas of the Institute for clinical diagnosis of cancer and other diseases and personalised treatments based on genomic information. Prof Chris Goodnow was appointed Executive Director in 2018, and will drive the next chapter of Garvan’s research and discovery. 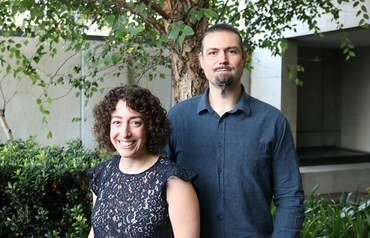 This already includes developing the next generation of high resolution imaging and gene expression analysis through the establishment of the Garvan-Weizmann Centre for Cellular Genomics and an affiliation with UNSW Sydney. 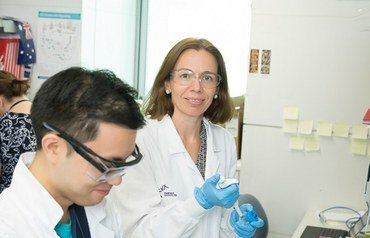 The Garvan Institute continues to be at the forefront of advances in medical research, contributing to the increasingly rapid and affordable genome sequencing and the associated promise of 'personalised medicine' – both of which are set to revolutionise medicine over the next 50 years. For more information about our history, see the Garvan Institute Wikipedia page.